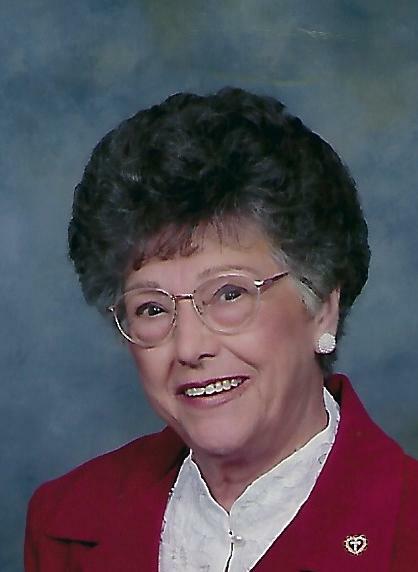 Mary Lou Chrisman, age 91, of Sidney passed away at 2:26 p.m. on Monday, July 2, 2018 in the home of her daughter, Rosie Jackson, where she received loving care for the last six years. Born on December 27, 1926 in Mercer County, OH, Mary Lou was a daughter of the late Jerry and Anna (Spicer) Sweigart. She married Huber Clark Chrisman on May 25, 1945 and he preceded her in death on March 27, 1978. Together they raised three daughters: Cherryl (William) Styles of Kettering, Rosie Jackson (Duane Neuenschwander) and Vicki (Bruce) Knasel all of Sidney. She was a loving grandmother to six grandchildren: Rob Jackson (Sharon Steele), Lance (Pam) Styles, Laura (Jeff) Huelskamp, Erik (Sarah Linklader) Styles, Kristen (John) Batton, Kara (Keith) Wiley, and eight great grandchildren: Calista, Mason, Madison, MaCalla, Jessica, Jenna, Kavin, and Kale. She is also survived by a brother, Harry (Ida) Sweigart of Sidney, three sisters, Vonda Smith and Ada Groves of Sidney and Bertha Drees of Dayton, a sister-in-law, Eileen Sweigart of Sidney, many nieces, nephews extended family members and a team of loving caregivers who made it possible for Mary Lou to remain at home. In addition to her parents and husband, a sister, Beatrice Lenz, and three brothers, Dallas, Louis, and Francis Sweigart preceded her in death. Mary Lou was a 1945 graduate of Green Township High School and a member of the GreenView United Church of Christ, Sidney. Mary Lou and Huber were farmers, and she continued farming after his death. In 1958, Mary Lou organized and coached a little league team for Plattsville and she enjoyed playing softball. She also enjoyed sewing and upholstering, and cooking. She was well known for her fried chicken and homemade noodles. Mary Lou never knew a stranger and welcomed everyone with open arms. She was a caregiver of many and a strong woman of faith. She was an avid bowler and earned her place in the hall of fame. Funeral services will be held on Saturday, July 7th at 10:30 a.m. in the Suber-Shively Funeral Home, 201 W. Main Street, Fletcher, Ohio 45326 with Reverend Joe Pumphrey and Reverend Cherryl Styles co-officiating. Burial will follow in Plattsville Cemetery. Visitation for family and friends will be held in the funeral home on Friday, July 6, 2018 from 5:00 p.m. to 8:00 p.m. Memorial donations in Mary Lou’s name may be made to GIVE Medical Ministry, 1000 Mote Drive, Covington, Ohio 45318, or to the GreenView United Church of Christ, 3041 Leatherwood Creek Road, Sidney, Ohio 45365. Condolences to the family may be sent to www.shivelyfuneralhomes.com..